Every now and then a show comes along which, though not as familiar or even known to many manages to attain the status of cult classic. 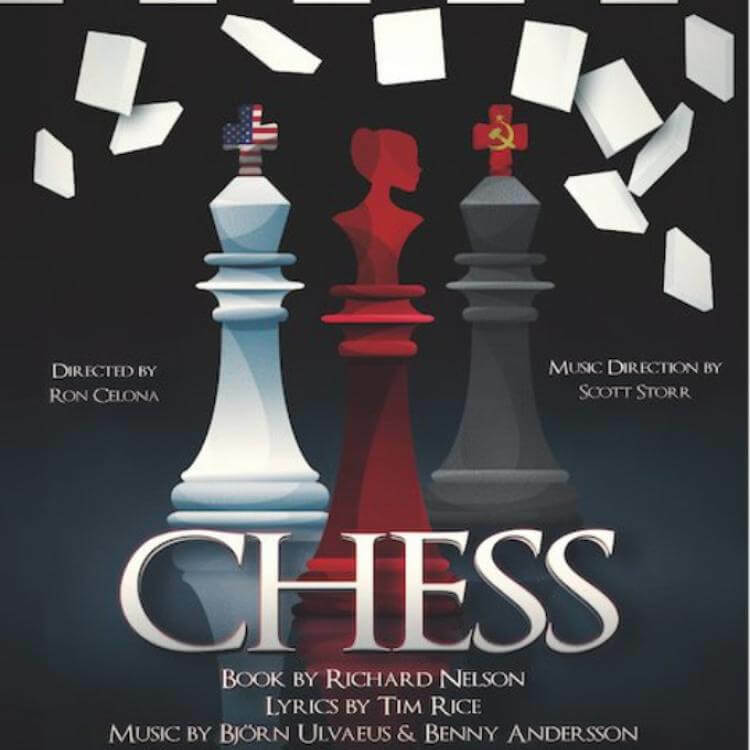 CHESS is one of those musicals and thanks to the CVRep and its strong production of this show, you will most likely join the ranks of CHESS fans all over the world. With music by Bjorn Ulvaeus and Benny Andersson (the B’s of ABBA) and lyrics by Tim Rice, the score is reason enough to see the show. In an age when not many ‘show tunes’ make it to the pop charts, CHESS did it twice with ONE NIGHT IN BANGKOK and I KNOW HIM SO WELL. But this is a show with a wealth of songs, all of which propel the show forward or, at the very least, reveal much about the character singing. American player and who gets her career and affections hopelessly trapped in-between. Each player has one or more people hovering around, ostensibly to help. For Freddie, there’s his manager, Walter (Glenn Rosenblum) who may be managing more than Freddie’s career. 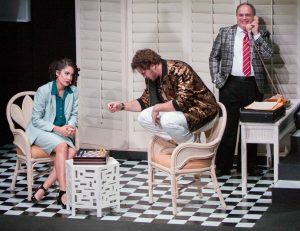 Anatoly has Molokov (Michael Dotson) whose managing style is straight out of the KGB handbook and is not beyond threatening people’s lives to get what he wants., including that of Svetlana (Ashley Hunt), Anatoly’s ex-wife in every way but the legal way. 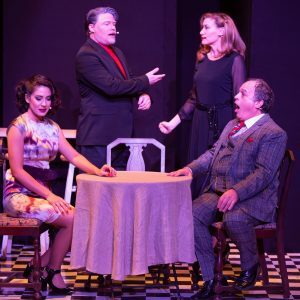 The script to CHESS is one that is always being tinkered with, much like that of MERRILY WE ROLL ALONG and other cult favorite shows. 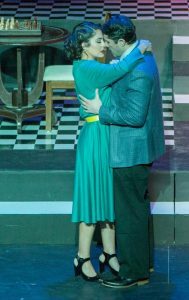 Some productions make everything from scenic elements to the cast size larger while others have stripped away very minor characters, unnecessary and confusing subplots and large chorus numbers in favor of focusing on what I feel is the true heart of CHESS; the love triangle. Happily, I can report that it is the latter style which director Ron Celona has chosen. This takes a show which in London ran just over 3 hours and felt at times too slow, distant and drawn out to a very comfortable length and a core of characters we get to really understand. Thus, the questions of whether the Russian player will defect or not and what path and partner Florence will take, are questions we come to care about as the political pressures from both sides jostle the characters about like small boats on a windy ocean. Of course, no show is perfect. Some of the changes in the order of songs, locations and plot twists create a few unanswered questions of their own and some of the choreography for the small but hardworking chorus veers too closely to classical ballet for such a rock infused score but these are minor complaints in comparison to the strengths of the show. Aside from the marvelous score already mentioned, CHESS has a first-rate cast. It is not the easiest score to sing but the 4 principals traverse its many octaves and ever-changing rhythms effortlessly. Ms, Carrillo’s rendition of SOMEONE ELSE’S STORY reveals the depth of Florence’s dilemma. I KNOW HIM SO WELL, her duet with the equally strong actress and singer, Ms. Hunt, is truly moving as the two women in Anatoly’s life speak of their love and what-ifs of their relationships with him. Mr. Sattler has a glorious voice and thrillingly closes the first act with his powerful rendition of ANTHEM in which he says that his homeland is not any nation but wherever his heart belongs. When using his rock and roll voice, Mr. Marshall perfectly conveys the bad boy image of his character most notably in FREDDIE’S ENTRANCE and PITY THE CHILD. Although I believe it should be, CHESS is not a frequently produced musical. 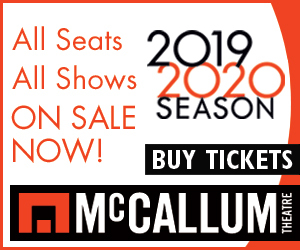 I suggest you grab the chance and make your next move getting tickets while it is here. CHESS is being presented by the CVRep in their wonderful new home at the one-time Imax theatre. Considering the strength of their productions, it is a well-deserved and long overdue upgrade. 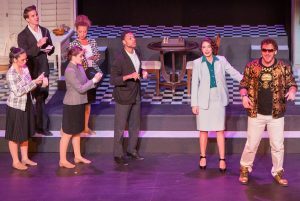 CHESS runs now through March 31, 2019. 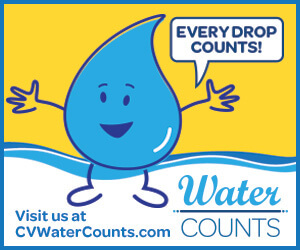 For tickets or further information go to www.CVRep.org.